Remember when it was thought that Chip Kelly was all but a signing of a contract away from becoming the next coach of the Cleveland Browns? Those were the days, I guess, but Kelly elected to not take the Cleveland job before returning to Eugene after declining to take the Eagles job. 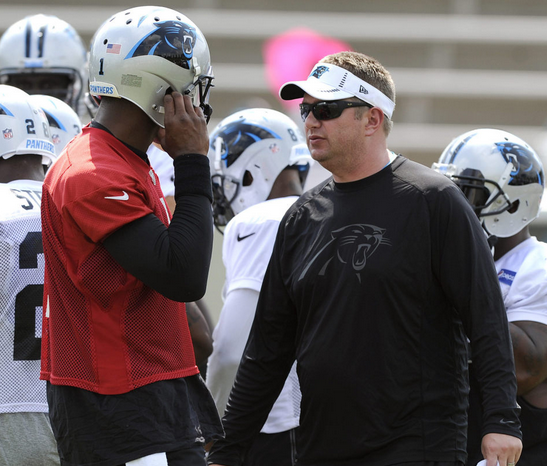 But alas, the Browns have found their man and it is Panthers offensive coordinator Rob Chudzinski. This hiring took some by surprise but was it a good hire? While this really has nothing to do with the hiring, Chudzinski is going home again. Chudzinski is a native of the Buckeye State, hailing from the great town of Toledo. He also has coached for the Browns before as well, serving as their tight ends coach in 2004 under Butch Davis and Terry Robiskie and as their offensive coordinator in 2007 and 2008 under Romeo Crennel. An Ohio guy taking over the an Ohio NFL team seems right. Chudzinski brings a solid resume to the Browns. He was the playcaller the last time the Browns had a winning record in 2007 when they went 10-6 and nearly made it to the playoffs behind the eighth ranked offense in the league. In case you forget, that was the year that Derek Anderson threw for a bunch of yards and actually looked somewhat like a quarterback. Unsurprisingly, the team fell apart the next year, sliding to 4-12, leading to Crennel's and Chudzinski's dismissal with the second worst offense in the league. But after returning to the Chargers as tight ends coach, where he had worked before taking the Browns coordinating job, he was hired by Ron Rivera last season to run the Panthers' offense and subsequently work with Cam Newton. As we all know, Newton was brilliant last season, which led to unreasonably high expectations for this year. With inconsistent play from Newton early on, as well as immaturity from Newton, the team started 2-8 before ending strong with a 4-1 record down the stretch behind a regenerated Newton. Chudzinski may not have been the most popular man in Charlotte before taking this job in Cleveland but the offense did perform pretty well these past two years, finishing at eighth and twelfth in the league. As I have mentioned before, the Browns were pretty competitive this year despite the 5-11 finish, because had they gotten a break here and there, they could have finished 8-8. There is some young talent on this team on both sides of the ball which if it were developed by the right coach, could become a contender for the playoffs. And the current pieces on offense are good fits for Chudzinski's offensive style, which is based on physical running and downfield passing. Nobody knows what he thinks of Brandon Weeden but Weeden's strong arm as well as some talented wideouts in Josh Gordon and Greg Little makes him a good fit for the offense and he did show some flashes this past season, although it could be off-puting that he will turn 30 during the season. Trent Richardson really showed flashes of Pro Bowl potential this season and his physical style, as well as his good hans, makes him a good fit for this offense and he should florish. The best part of Chudzinski's hiring is that he could bring Norv Turner to town as the offensive coordinator. Turner, just fired by the Chargers, used to have Chudzinski on his staff as an assistant head coach and with Jason La Canfora reporting that Turner is not interested in the high profile openings on the Jets and Cowboys staffs, the Browns may be the front-runner (although Turner could be very well intrigued by working with Newton and his former defensive coordinator, Rivera). And while Turner is an awful head coach, he is a tremendous offensive coordinator and don't forget, he was the only coach to make Alex Smith look competent before Jim Harbaugh took the job. Overall, I think this is a solid hire but above all else, the Browns need some stability and they need to win. Since they rejoined the NFL, they have not had a coach last more than four years and none have them have had any consistent success. Maybe Chudzinski is that guy who can break the trend.